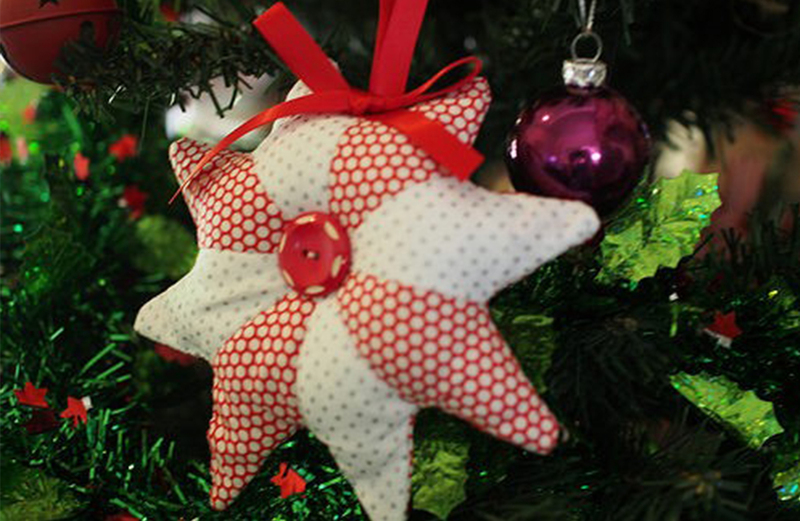 This project is a great chance to try out English Paper Piecing as we create 8 point stars that can be joined to make Christmas tree decorations or appliquéd onto Christmas stockings or cushions. You can also make 6 point stars using diamonds and the same technique (but 60 degree diamonds instead of 45 degree diamonds as used for this one). 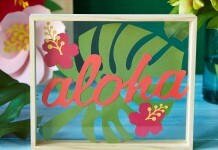 Packs of paper pieces can be found at quilting shops or eBay for about $5-$6 a pack and can be reused. 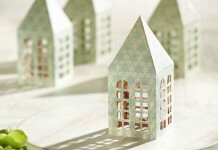 Take one paper diamond and a scrap of fabric. 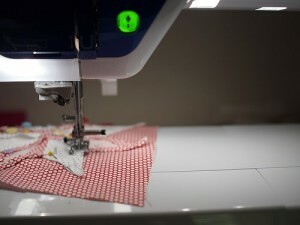 Pin the diamond to the wrong side of the fabric and cut out the fabric leaving a seam allowance of about ½ inch as you go around. 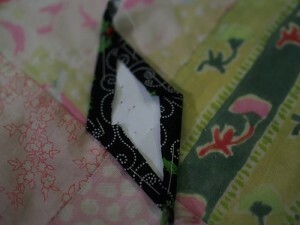 With a needle and thread you are going to baste the fabric to the paper diamond using long stitches. 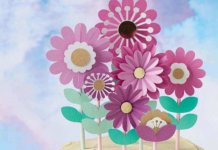 You can use a special fabric glue pen designed for paper piecing if you prefer. When you get to the points at the top of the diamond you will have a little ‘wing’ to the side. Make the point directly underneath have the little bit of fabric go to the opposite side. Take care to note which way you are working (clockwise/anti-clockwise) with your basting as you want to do each diamond in the same direction. Repeat until you have 8 diamonds. 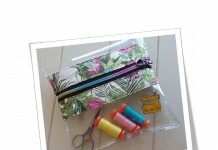 You can use all different fabric designs or 2 fabrics or just the 1 fabric, the choice is yours. Now we are going to join diamonds together into half the star. So you take 2 diamonds and with a needle and thread and tiny stitches join them along one side. I like to start from the outside edge moving to the centre point. Open out, take another diamond and join it to the side and repeat until you have 4 diamonds joined together forming half a star. Now repeat with the remaining 4 diamonds to create another half star. You don’t want to join them in the round the same way you would with hexagons. For the star we want two half stars that we will then join together. 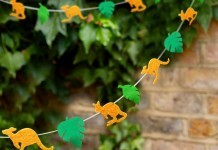 Pin the 2 halves together with right sides together and centre points matching up. Place the pin over the centre joins so that they stay in place as you stitch from one end to the other. 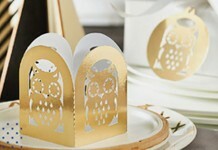 Again you are using tiny stitches that don’t touch the paper but join the fabrics together. Secure threads and trim. At the iron press your star well. Now snip all the basting threads and remove the threads and papers. Press well and take care to press those points of your star well so they keep their shape now that the papers have been removed. 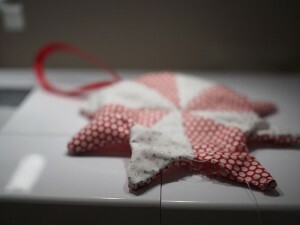 Cut a piece of fabric for the back of your star but don’t cut it to the size of the star. A nice square is perfect. Because you want to keep the shape of the paper pieced star we will sew our star to the square of fabric and then trim neatly. 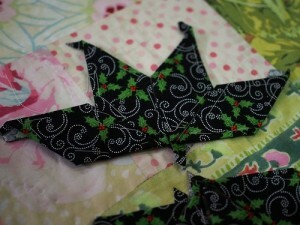 Pin the star to the square of backing fabric (right sides together) and take to the machine. 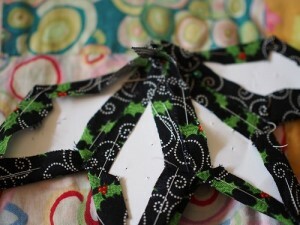 Cut about 10cms of ribbon/tape and make a loop and tuck inside the star between the right sides together. Have the edges of the ribbon outside the raw edges of the star. 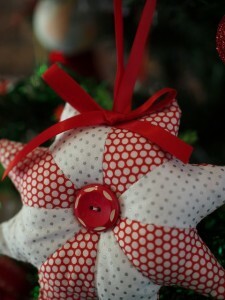 That way when you turn your star out you will have a hanging ribbon on top of your star. 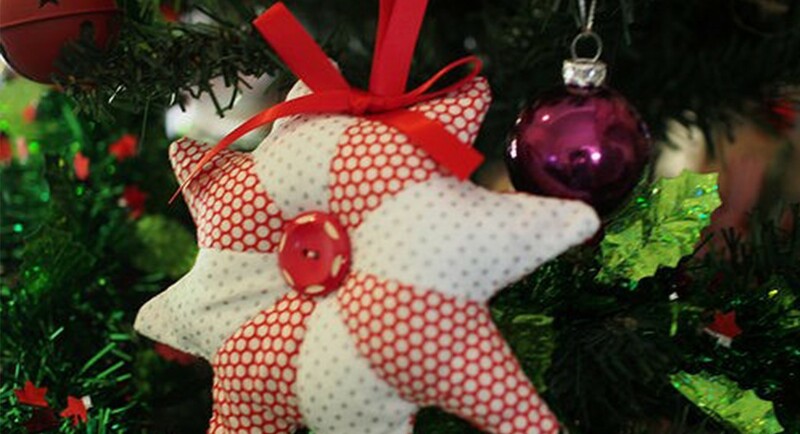 Using a ¼ seam sew around the star leaving a gap of about 1 ½ inches to turn out your star. Take your time and finish each line of stitches on the fabric join between diamonds. This will give you a neat star when you turn it out. 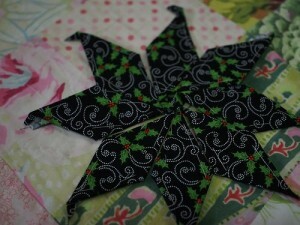 Now cut the excess backing fabric around the star and turn right side out. Use a pin to gently pull out the corners of the star. It won’t look pretty but now you are ready to fill your star. Taking a little bit of filling at a time fill the star and push the filling into the corners of the star. It’s best to take your time with it and you can use the end of a knitting needle to push it in. 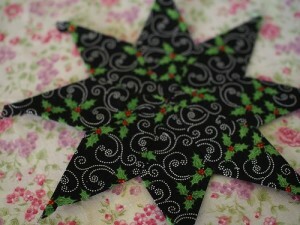 With a needle and thread close up the star with some whip stitches. 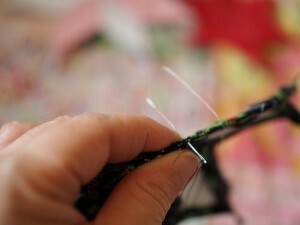 You might find you want to add a bit more stuffing into the points near your opening as you are sewing it closed. Sew a button into the centre of your star (this is optional) but helps keep the filling in place and gives you a fuller looking star. 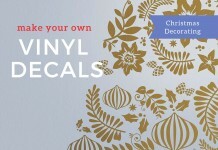 And a small bow of ribbon can be added to the top of the star to make it even prettier. You are done! 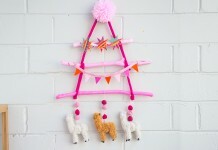 Hang on the tree and you’ll find yourself wanting to make more!